Keel -billed Toucan, also known as Sulphur-breasted Toucan, is a small social playful bird mainly found in Central and South America. It is the smallest of all the Toucans. Its bill is one of the most colorful beaks in the bird world. This bird is also known as Rainbow-billed Toucan. It is the national bird of Belize. The average size of a Keel-billed Toucan is around 20-22 inches in length and weighs around 500 grams. Though this bird is not a good flyer yet it can reach around 35 mile per hour. The size of its bill is around one third of its length. The color of its bill is a mixture of green, red, orange and yellow. Its colorful bill, which is hollow inside, is very light and is actually made of a hard and protein substance known as keratin. The edge of the beak has small tooth-like ridges. It has a feather-like tongue inside the beak. Its body is covered with black feathers; the chest is light green and the tip of its tail is red. Molting happens once in a year. It has blue feet with toes facing in different directions. Males are slightly larger than females. In Central America it is found in the southern part of Mexico. In Southern America, it is found in regions like Colombia, Venezuela, Costa Rica to Caribbean islands. Keel-billed Toucan tends to live around tropical, subtropical and lowland rainforests. It usually lives in groups. It nests in natural tree holes, or made by woodpecker, primarily on tree tops and often with other family members. While sleeping in the tree hole, it sleeps with its bill and tail tucked under its body to make space for other family members. It is a social bird and rarely seen alone. In the wild, this species prefers to stay in lowland rain forest regions. It usually roams around within a small range. It is also very friendly with humans, as pets or in zoos once trained properly. It has a family structure within its group. It usually lives in a group of around 8 birds though the numbers can go up to around 20. It is known to loiter around in small folks. Keel-billed Toucans are not very good at flying. It generally moves around by hopping from one tree branch to another. It often engages in a duel with other birds within its group, throwing fruits at each other by using its long beak. In the wild, Keel-bill Toucan lives for around 15 to 20 years. Both males and the females are known to reach sexual maturity at the age of three years. Mating happens throughout the year. Female Keel-billed can lay up to four white colored eggs in one clutch. Both the male and the female take part in incubation. Generally, it takes around 20 days to hatch the eggs. Both the male and the female feed and look after its chicks. New born chicks have no feathers and eyes closed for around 20 days. The chicks take almost eight weeks to be ready to fly. Keel-billed Toucan is an omnivorous bird. This species primarily feeds on different kinds of fruits and berries, especially small in size. One can often see it eating the whole fruit, usually picking it up with its bill, tossing it up and swallow it whole. Its diet also consists of insects, small frogs, small lizards, eggs of small birds. It is generally spotted feeding in high canopy. Its call sounds like rrrek…rrrek. Each call has a different pitch. Its call can be heard from one kilo-meter away, in the wild. Keel-billed Toucans are listed among the least concerned birds by International Union for Conservation of Nature, mainly due to their large range in South America. Though it is not an endangered species yet due to the loss of their habitat, deforestation and illegal pet trade, it is considered threatened. In the wild, the main predators of Keel-billed Toucan are large birds of prey. Snakes, weasels and other birds of prey are found to target its egg. In recent times, humans have become one of its main enemies as this bird is captured for illegal trade. This species has huge popularity in zoos around the world, primarily because of its colorful long beak, among all ages. Keel-billed Toucan can be a good pet as it is a friendly and intelligent bird. These birds can be easily trained to perform tricks. 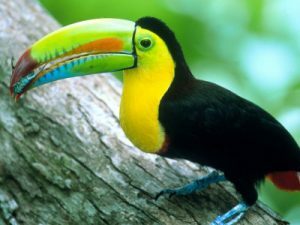 A pet Keel-billed Toucan need to feed it with different kinds of fruits and berries like papaya, grapes etc. It needs fresh water daily. One needs to keep this bird in large cages. Unlike most other birds, keeping it in captivity can be too costly. This species is not known to carry any particular virus of any disease. 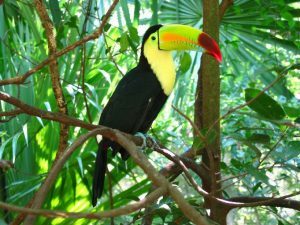 Keel-billed Toucans has not been legally imported to the United States since 1992. In 1976 Keel-billed Toucans were first bred in captivity in Houston Zoo. It is thought to be the incarnation of a demon, in its native region. According to the myth, the father of a new born child must not eat its flesh as it may bewitch the new-born. 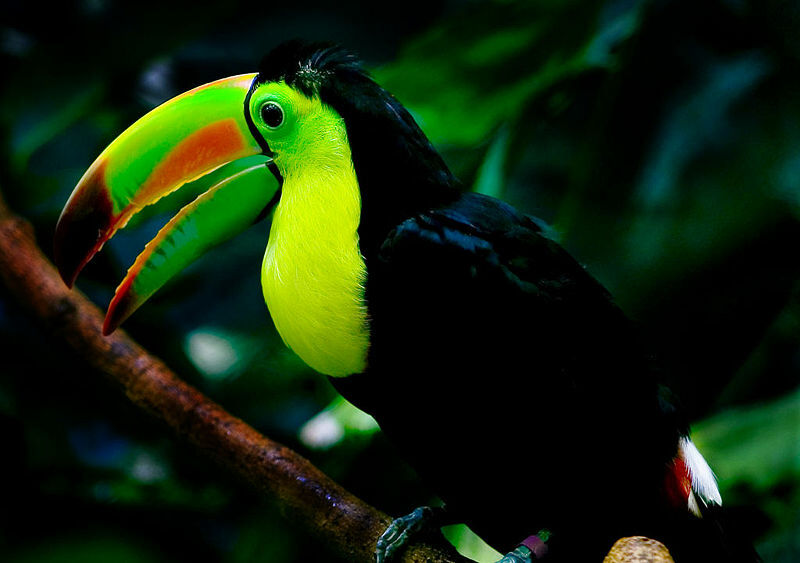 There are several species of Toucan and it is distinguished by size, body coloring, beak size and beak coloring. 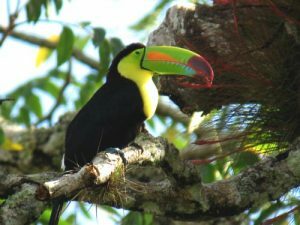 The characteristics of the Toucans are almost same. Its color produces a perfect camouflage in tropical and subtropical rainforest. Since it is the national bird of Belize, it brings large number of tourists to Belize. This also helps the country from the economic point of view. In some markets of the world Keel-billed Toucans are available for sale, as these birds are very popular as pets. The price may vary depending on the size, age and health of the bird. If any one wishes to buy a Keel-bill, he or she should make sure that it is not illegal, since this bird is traded illegally and banned in some countries. I luv this type of animal awesome pics!